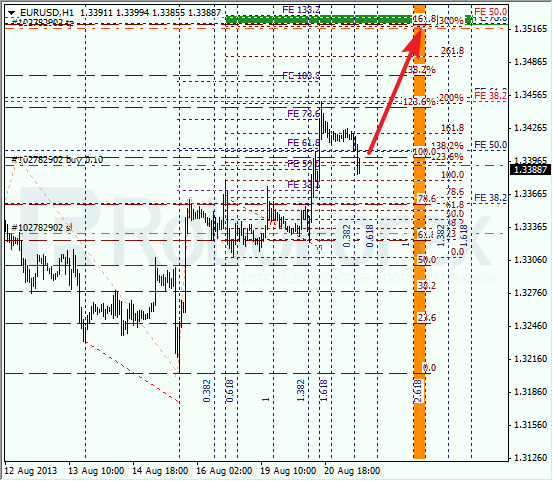 Yesterday Euro reached its target level and Take Profit on my buy order worked. During the following correction, I opened a long position again. We can’t exclude a possibility that in the nearest future the price may reach the level of 1.35, where there are several fibo levels, 161.8%, 78.6%, and 50%. 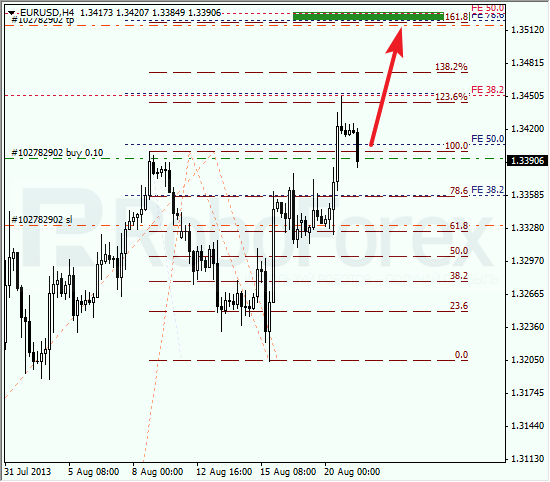 At the H1 chart we can see, that there are confirming fibo levels, 138.2% and 300%, in the target area. According to the analysis of the temporary fibo-zones, the predicted targets may be reached during the next 24 hours. I’m planning to move the stop into the black after the price breaks the maximum. Franc is also being corrected; I’ve already opened two sell orders. Most likely, the pair will break a local minimum during the day. The main target is in the area formed by three levels, 138.2%, 161.8%, and 61.8%. As we can see at the H1 chart, there is an additional confirming fibo-level, 161.8%. According to the analysis of the temporary fibo-zones, the target area may be reached on Friday. Later these levels may become a starting point of a new correction.